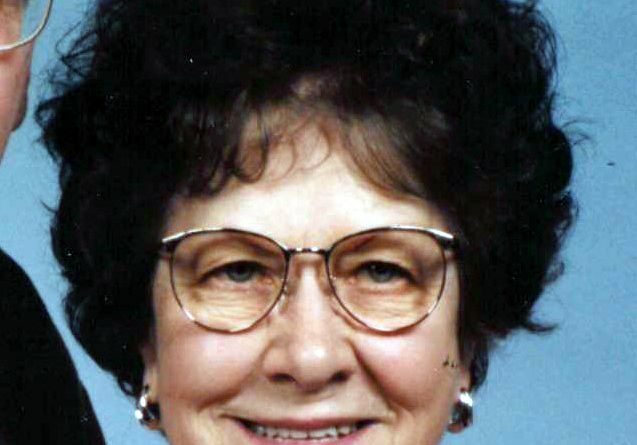 Marion Bemowski, age 89, passed away on Friday, Feb. 8, 2019, at the “Lodge” Whispering Pines in Plover. She was born on Nov. 23, 1929, in Stevens Point to Max and Verna (Lewandowski) Kruzicki. Her marriage to Emil Bemowski took place on Nov. 15, 1947, at St. Peter’s Catholic Church. She is survived by her six children; Kenneth (friend Peg) of Stevens Point, Diane (Robert) Johnson of Appleton, Bonnie (Steve) Anacker of La Farge, Sandra Nowak of Colgate, Susan (friend Scott) Hytry of Stevens Point and Julie (friend Joe) Keen of Stevens Point; 15 grandchildren; and 28 great-grandchildren. She is preceded in death by her husband Emil in 2004; four sisters; two brothers; and 1 son-in-law, Jerry Colgate. Funeral Mass will be at 11 a.m. on Wednesday, Feb. 13, 2019, at St. Peter’s Catholic Church. Rev. Arul Joseph V. will officiate. Burial will take place in the Guardian Angel Cemetery. Visitation will be from 9 a.m. until the time of service Wednesday morning in the St. Faustina Room. Pisarski Funeral Home is honored to be serving the Bemowski family. The family extends a heartfelt thank you to the caregivers at Whispering Pines, Ministry Hospice, and her special nieces Linda Firkus and Debbie Peltier for all their loving care. The family is forever grateful to our sister, Sue, for all the time and special care she gave Mom. Thanks, mom, for all the times you took time for all the sacrifices you’ve made and for all the wonderful memories you’ve given our family. You’ll always be loved so much.